After much hesitation and distrust, Rick and the group decided to follow Aaron to Alexandria on The Walking Dead Season 5 Episode 11. This new storyline marks a major intersection between the comics and the Sunday night series. 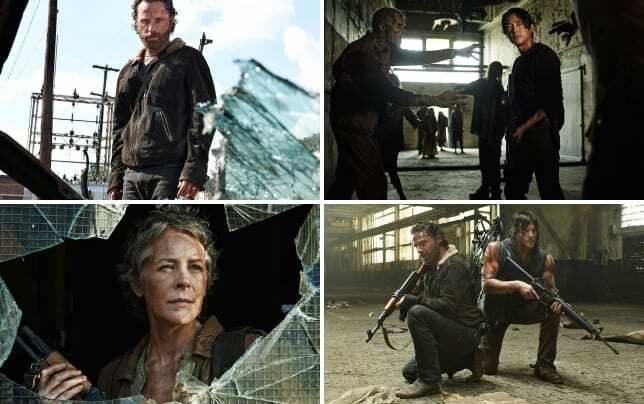 What's in store for Rick Grimes and his friends? What did we think about their journey to (hopefully) find sanctuary? Join Eric Nordhoff of the Walker Stalkers, Whitney Evans, Sean McKenna, and Miranda Wicker as we discuss that and more now! What was your favorite quote or scene from "The Distance"? Eric: Probably the moment Rick realizes he can finally (maybe) turn off the fight as they were about to make their way into Alexandria. Whitney: I absolutely loved Aaron and when's the last time someone made a funny joke on this show? I actually laughed when he said the audition process made it sound like they were a dance troupe. It may not have landed amongst the group, but I thought it was great. Sean: I liked when Rick went straight for the punch out with Aaron. It was a major surprise, but it fit right in line with Rick's immediate distrust. It set the wheels in motion as the group tried to figure out whether or not to trust Aaron. And wow did Rick turn on his intense mode. Miranda: I loved everything about Rick in this episode. He's right not to trust new people and new situations, so I enjoyed watching his vigilance at odds with others in the group who are eagerly looking for a place to rest. He wants that too, but he wants to be sure first. Why didn't Glenn turn on the windshield wipers? Eric: Seriously! Maybe they didn’t work…that vehicle was made in the 70’s. Whitney: That whole scene was frustrating, but yeah it made no sense for Glenn to not use the windshield wipers. I'm with Eric here, maybe they didn't work? Sean: I thought of that, too, but I was thinking that the moment just became so hectic that maybe he forgot? Everything seemed to be happening so fast and sometimes when tons of walkers are headed towards you, the rational thing might be a bit more difficult to think of. On a scale of lame to epic, where does the Flare To The Eye walker takedown method rank? Eric: It was a little hokey to me at first, but the more I think about it, it did seem closer to epic. I would give it a 7 on the epic-ness scale! Whitney: The visual sight of a walkers head glowing like a jack-o-lantern immediately gives it an 8 from me! I love that after 5 seasons, they are still coming up with creative ways to kill the walkers. Sean: The Walking Dead has always been on point with its special effects and being creative in the walker kills. I'd give it a 7. There was something kind of cool seeing it glowing in the dark. Like a really scary night light. Miranda: It was effective, for sure! Bonus? It lit up that corner of the woods quite nicely. I ditto Whitney that I love that they're still coming up with new ways to get the job done when it comes to taking out the walkers. Where were all of Aaron's people in the photos? Eric: My theory is I don’t think there are people there. It’s all imagined and they are desperate for people. Whitney: I really, really hope there are people there but it's not looking good. Were they really all just inside when those pictures were being taken? It's hard to buy that. Sean: I kept wondering if it was just Eric and Aaron in the group and no one else. But that fact he was able to even get some photos developed is a big deal in the zombie apocalypse. Something still feels fishy, but I want to believe Aaron. He just seems so sincere. Miranda: This was an extra creepy moment from the episode. If there are people like he says, where were they? Are they ghosts? Was he shooting at night? How were there no people out and about when we heard children playing on the other side of the walls? How soon after Rick and the gang's arrival will Alexandria become unsafe? Eric: I think it’s already unsafe. I would think within an episode or two we will find out the real danger around this place. Whitney: I'm thinking they will be there up until the finale when something will inevitably go wrong and our gang will have to make some drastic decisions. Sean: I agree about the finale. I think maybe some distrust or clues might pop in, but it won't be until the very end when everything really goes crazy and the group has to make those big decisions again. But I am excited to see where we go right now and what's behind those doors! 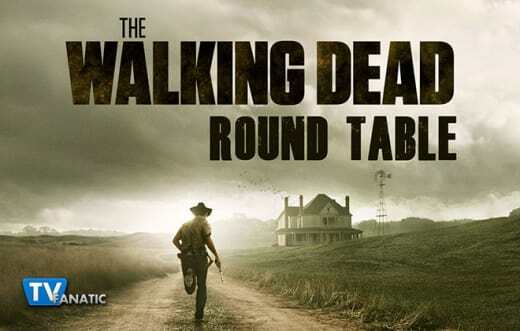 Miranda: What we know about sanctuaries on The Walking Dead is that nothing is as it seems. This place might be safe for now, but it won't be safe for long because Rick will surely smell a rat. He and his group aren't just survivors. They're warriors. It won't be long before they're face to face with the new threat. 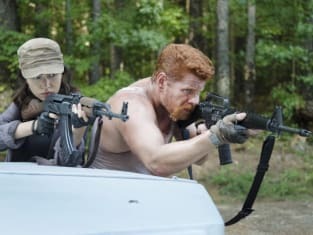 The Walking Dead Season 5 Episode 12, "Remember," airs Sunday night at 9 on AMC, or you can watch The Walking Dead online right here at TV Fanatic.